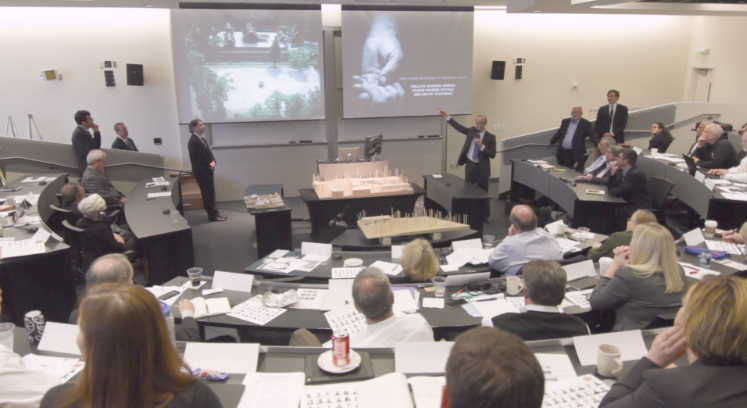 In Atlanta, Seattle and Charlotte, Howard S. Wertheimer, the university’s top architect, led panel discussions with both the winners and the runners-up of the ideas competition he helped organized to select the project’s design team. The experience offers an early hint at one way the Living Building Challenge might push the envelope on design and construction in the Southeast. “This process will change the way things will work going forward,“ Wertheimer says. The university’s assistant vice president for capital planning and space management, Wertheimer is now an enthusiastic proponent of ideas competition — for certain projects. They differ from design competitions, because they place less emphasis on what he calls “eye candy” and more on the problem-solving capacity of a design team. Already, Georgia Tech is engaging in a second ideas competition to find architects for a Student Center renovation and expansion. Meanwhile, the architects who competed to design the Living Building at Georgia Tech say the contest is having a profound impact on the way their firms approach environmentally oriented projects. “You really can’t un-know or unlearn what we’ve learned,” Chris Gray of Atlanta-based Collins Cooper Carusi said on one of the panels. The competition was cooked up by Wertheimer in consultation with Jason McLennan, the LBC’s primary author. McLennan, an adviser to the Kendeda Fund on the Georgia Tech project, has been encouraging owners to incorporate something along its lines since 2009, when the Packard Foundation used a similar contest as part of the Living Building work on its headquarters in Los Altos, Calif. The ideas competition is built on the premise that sustainable, high-performance buildings benefit when their architecture is integrated from the beginning with engineering and landscape design. The Tech ideas competition has sparked interest among architects and facilities planners. 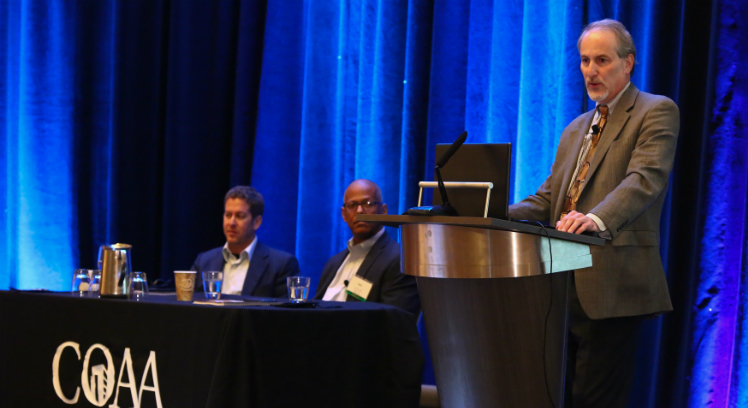 Here, Lord Aeck Sargent’s Joshua Gassman and Georgia Tech’s John DuConge join Tech’s Howard Wertheimer at the Construction Owners Association of America. Photo courtesy COAA. Georgia Tech kicked off the process in October 2015, shortly after the Kendeda Fund announced it was granting the university $30 million to design, construct and operate the building. Tech put out a call for design teams led by Georgia-based architects. The project’s overall design budget is $2.3 million. Just as importantly, the winner would lead the design team for a cutting edge building on one of the South’s most high-profile campuses. Although LBC experience wasn’t required, it was bound to help, and given that no Georgia architecture office has completed a fully certified Living Building, some of the hometown firms paired with out-of-town firms that had LBC experience. Wertheimer notes that the teamwork played into one of the strategic goals of the Kendeda Fund: By transferring knowledge to Georgia firms, the competition would help to “build capacity in this region” for the Living Building Challenge. In November, Tech whittled the 17 teams that expressed interest down to five. In December, three were shortlisted. Careful what you ask for. Through the winter, each team was consumed by a contest that demanded more time and effort than the typical design competition. The firms spent hundreds of professional hours evaluating various site options; researching cutting-edge materials, products and techniques; and contriving schemes that had the potential to meet the Living Building Challenge’s exacting standards. Each team’s expense was partially offset by a stipend of $35,000. Evaluating the site was a core challenge for the contestants. 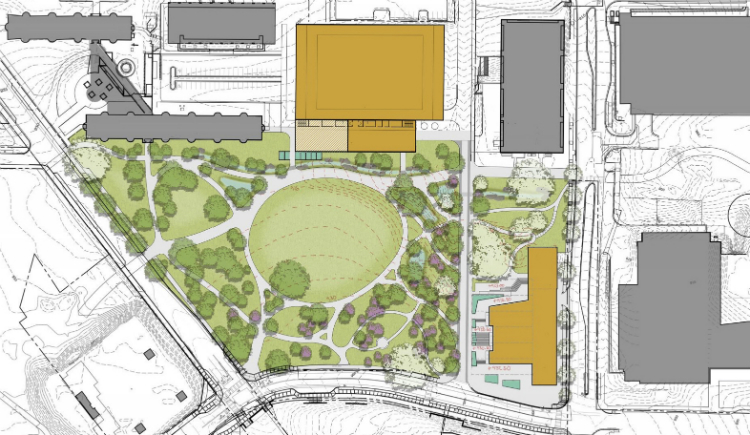 They were told that the 42,000-square-foot structure would be built somewhere on an eight-acre quadrant of the campus slated to become part of the Eco-Commons, the university’s signature regenerative landscape project. It was up to the teams to propose the specific location. 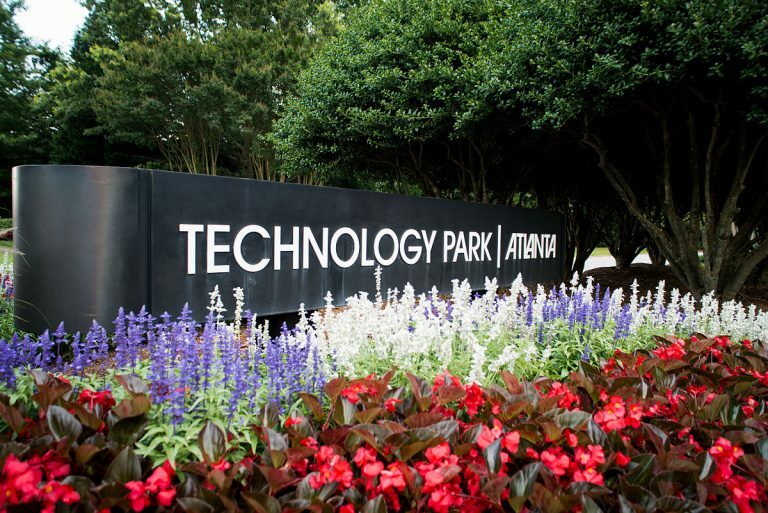 In case all those tasks didn’t seem ambitious enough, an idealistic mandate — befitting the Living Building Challenge — was buried amid the nitty-gritty of Georgia Tech’s guidance to the finalists: “Design teams should think about how this project can change the world, the region, the city, and the campus.“ Not exactly a small order. In its simplest terms, the ideas competition can be viewed as reordering a chicken-and-egg issue in the design of commercial buildings. Unfettered by other professionals, architects can efficiently hone a singular vision. Or so the theory goes. The problem is that, in an era of high-performance buildings, it can be much more difficult to resolve engineering and site issues after the big design decisions are made. The ideas competition addressed that chicken and egg by relying on a heavy dose of the kind of integrated planning typical for sustainable projects. Except, in this case, the integration would start before anybody won the job. Each team had to engage engineers, landscape architects, cost estimators and other specialists. 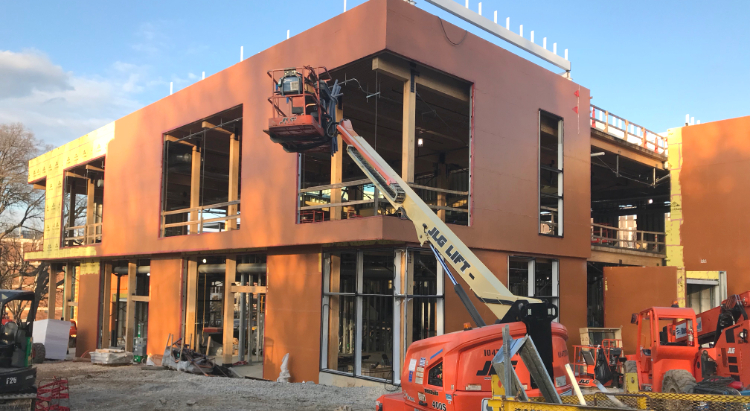 Those consultants wouldn’t be there simply to rough out the general features that the owner could get for the $18.6 million construction budget; they would actively engage with architects in solving problems — and in the design itself. In guidance documents, the finalists were told that the “quality of proposed design plan” would count for only 15 percent of the evaluation, while softer factors such as the “overall Impression of the firm and the overall impression of key team members,” along with “effectiveness in communication of the team members during the interview process,” would count for half. Georgia Tech and Kendeda Fund officials observe one of one of the design teams working together during a “touchpoint” work session at Collins Cooper Carusi in Atlanta. Photo courtesy: Georgia Institute of Technology. In January and February of 2016, the finalists were asked to open their doors to a phalanx of observers at two all-day “touchpoint” work sessions. Wertheimer and others from Tech — including Executive Vice President Steve Swant — attended. So did School of Architecture students and faculty members, who were engaged in a parallel studio on the building. 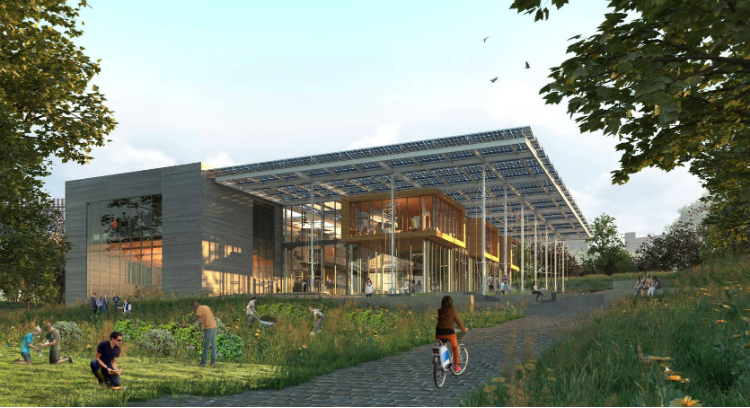 Kendeda was represented by Working Building Principal John McFarland, who’s serving as the donor’s representative throughout design and construction, and McLennan Design’s Mona Lemoine, a consultant who’s the project’s Living Building Challenge coach. Although Tech Project Manager John DuConge sent the teams written feedback after each workshop, the observers were there mainly to see how the various professionals worked together. Lord Aeck Sargent president Joe Greco joked later that his team took to searching facial expressions for hints. “They did a terrific job of barely answering anything,“ he quipped. The ideas competition’s unusual demands drove the three teams to work together in unusual ways. That was particularly true for the one group that included three architectural partners. In addition to Collins Cooper Carusi of Atlanta, Eskew+Dumez+Ripple of New Orleans and Hellmuth+Bicknese of St. Louis, the three-headed group included both local and out-of-town landscape architects, two mechanical engineering firms, an energy modeling consultant, a structural engineering firm and a cost estimator. According to EDR’s Z Smith, 28 professionals poured some 4,500 hours into the team’s work for the competition. So team members in various cities got used to communicating via Slack and also set up a website where they could dump and share intelligence. With information so sparse about Living Buildings in the South, they reached for leads from other firms, professionals and publications. Eskew+Dumez+Ripplie’s Z Smith leads his team’s presentation before the Georgia Tech Planning & Design Commission. Photo courtesy Georgia Tech. That pitch came in March, when the finalists presented their proposals to the Georgia Tech Planning and Design Commission, a panel of well-established architects, landscape architects and other professionals that advises the university on major design decisions. At that point, the teams also were required to turn the intellectual property they’d acquired over to the university. This included BIM (building information model) files, cost estimates, energy and water strategies, proposed materials, and even an explanation of university or municipal policy changes that might be necessary to complete the building. Wertheimer was clear that Georgia Tech viewed the ideas competition as an opportunity to tap great ideas from the losers, as well as the winner. In addition to the Planning and Design Commission and Georgia Tech staff, six representatives of Kendeda were in the room to play a role in the review process. Each of the three finalists drew enthusiasts. Creech says the Collins/Eskew/Hellmuth team’s encyclopedic website was one of their strong points. Another team, led by Atlanta-based Perkins+Will, drew on its in-house sustainability track record: The mega-firm didn’t need to partner with another group of architects because its San Francisco office had recently completed a building constructed to LBC standards. As it turns out, LAS/Miller Hull’s design proposals did play a role in the decision. The scheme now being refined for the actual building places it in the southeast corner of the eight-acre Eco-Commons site. The rectangular structure will rely on its long, east wall to shield the building from State Street, which borders the site. Meanwhile, the western facade opens up to the Eco-Commons through the use of a familiar and practical feature of Southern buildings: the porch. The arrangement drew appreciation for its clever reliance on an updated bit of regional vernacular; the porch would offer of a grand view of the Eco-Commons while drawing nature and daylight into the building itself. This drawing from the winning team shows their proposed placement of the Living Building in the southeast corner of the Eco-Commons site (lower right). 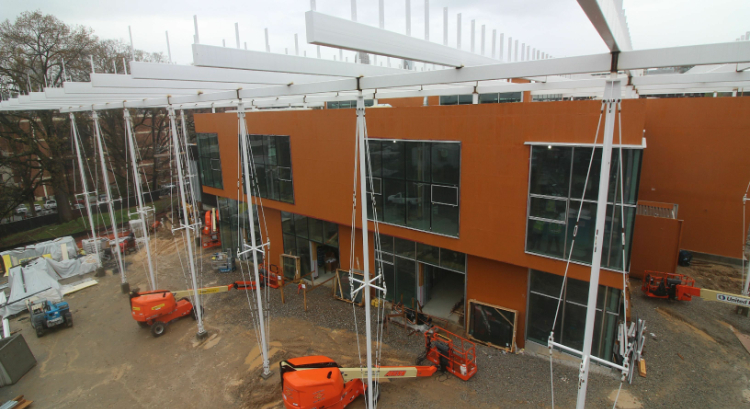 This “porch” scheme opens views west toward the Eco-Commons. Image courtesy Jose Alminana/Andropogon Associates. One testament to Wertheimer’s new enthusiasm for ideas competitions is the decision this fall to set up another one for the renovation and expansion of Georgia Tech’s Student Center Complex (even though that project isn’t seeking Living Building Challenge certification). He says Tech learned from the earlier contest. This time, for example, they’ll place a lighter load on the architects by requiring only one “touchpoint” session and hiking the stipend to $50,000. Wertheimer cautions that ideas competitions aren’t appropriate for every project. In fact, had it not been for the challenge of settling a specific site, he wouldn’t have relied on such a complicated approach for the Living Building (the Student Center expansion involves a similar site decision). All the finalists acknowledged potential drawbacks to the ideas competition as it was structured. Smith noted that the upfront resources required to compete might discourage small firms from participating. Others warned that firms might tolerate more demands from Georgia Tech than from a less prestigious client. And the enigmatic criteria was particularly challenging for well-established architects who are used to winning contracts based on their portfolios and drawings. According to Creech, that was about as bright an outcome as could be hoped for from any type of architect-selection process. The ideas competition served Tech’s purposes more concretely. Wertheimer makes no bones about the fact that the process helped his own team get up to speed on overseeing an LBC project. 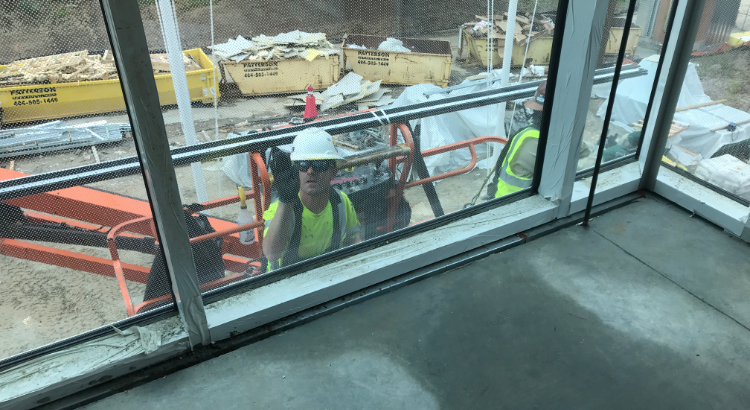 To keep up with Deep South’s first major Living Building project and for more resources on the Living Building Challenge subscribe here.